AAF football.....on CBS national tv. yikes.......what the heck is the AAF ??? Blair KielGOOD OL' FAKE BLAIR KIEL - Now a Saints fan! Goldie, I don't know if they have different games in different markets, but I have Atlanta vs Orlando here in metro Atlanta area. From what I've seen it's mostly second-rate football. They have some funky rules (no XPA, no more than 5 rushers on defense), and just enough ex-NFL players/coaches to add an air of legitimacy. So far, more air than legitimacy. Michael Vick was the OC of the Atlanta team...until this week, apparently. "Network responsibilities kept him away from the team this week, and he likely won't be returning", per local news. Steve Spurrier is the HC for the Orlando team. Matt Simms is the QB for Atlanta, and he is as gawd-awful as he was in Tennessee. Google is your friend. Don't be afraid to use it. I'm in a red state. Saw the QB get completely blown up. No flag. Guess it's ok in this league. How could he not see him coming from 10ys away? Thank you..... have not really heard or bothered to care about it......but thanks for this information. What, no thanks for my links?? Dave in GASay my name! eh...probably not too hard to beat the NBA......does anyone watch it anymore? I need my off season. I also don't think its hard to beat NBA ratings especially this time of year. Also, to me there is just too much middle school type drama surrounding the players that has me turned off. Yup...loved the Larry Bird/Magic Johnson era....that guy in Chicago was ok...that was it for me....never looked back. I loved NBA basketball during the '60's and '70's. Elgin Baylor, Jerry West, Wilt the Stilt; then Dr. J, Kurt Rambus, and Chocolate Thunder, then into the Magic/Bird era. How many other great players am I forgetting? Same here Timmy, luved the NBA, even drove down to Bradley University to watch Bird when he was at Indiana St. Funny thing was, Bradley double teamed him all night long and he still scored 38 points. a few more to your list. John Havlicek. Walt Frazier, Pistol Pete, and of course the big boyz Kareem, Bob Lanier, Bill Russel. Earl Monroe, Hal Greer and one of my favorite all time college player, Dean The Dream Memminger. He went the Knicks and played behind Walt and The Pearl, pretty tough to break into that duo. He was a great guard in the New York City way, one of many. I went a number of years not watching the NBA much but the 2014-2015 Golden State team got me back into it. Now with the Bucks having their best team in maybe 30+ years and I've watched a lot more than I did for a long time. Kareem! Yes! Sky hook forever! Lanier's shoes--size 22 or something? Sitting in the Lufthansa lounge in Frankfurt I ran into three NBA scouts that were wrapping up a multi country tour of 18 and under talent. They wouldn't tell me what team they were with but they were on the same flight as mine. FRA to SFO. So it's Golden State or Sacramento. Anyway. We got into a discussion about what athletes would have been all time Social Media follows if the internet was around in 1950. Everyone agreed Muhamad Ali would have been the greatest online sports figure of all time. Then Jackie Robinson. Then Hank Aaron. Then they argued very strongly John Wooden, Bill Walton and Pistol Pete would be next. I thought Gordie Howe and Art Donavan would have been legendary if they had an unedited voice online. WTF were you doing in Germany?? Just a little work. Trade show at Messe Frankfurt. Pro travel tip. Do not ever fly United 777-300ER long haul. Just don’t. It’s a 3-4-3 configuration in economy. It’s 11 hours and 20 minutes of pure crowded hell unless you catch a business class upgrade. Best way to describe that flight is rubbing elbows with assholes. Even worse is you land at 3:30pm and after customs you hop in your car and spend another 2 hours driving 47 miles home. But the weather in CA is great!!!!!! Good thing you weren't flying FLYBMI ...Hundreds of passengers throughout Europe, (Germany) were left stranded due to the abrupt collapse of the British airline. Flybmi was still seeking customers up until the day before the collapse. sheeeeeeeeeeesh, u could have been stuck in Europe for the winter, maybe take up skiing in the alps for a couple months. When I visited my German relatives back in '89, the employees of the charter airline I took went on strike while I was there. Fortunately the strike was resolved before the flight home. if it was me FEDYA, I would have called miss skully, and told her I might be stuck in Munich for a couple extra days. Hungry5I'm a highly successful football fan. My wife got kicked out of the Alamo for taking a non flashbulb picture. I'm still looking for the basement in the Alamo. Was at the Alamo this week. Looks like Santa Anna is still dead. China lurking. Might want to fire up militia H5? To me the Munger Hotel across the street is as interesting as the Alamo, Teddy signed up some of the Rough Riders there and Carrie Nation busted the place up in her prohibition campaign. Beautiful old decor and some good cold beer on tap. 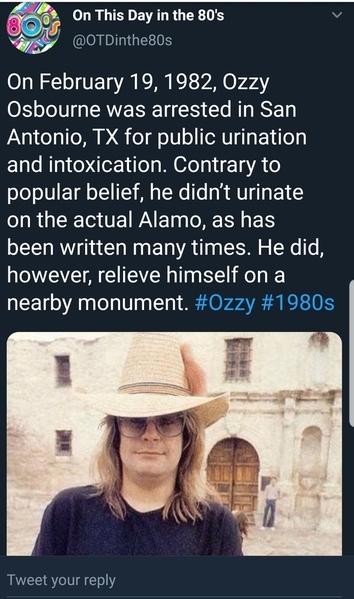 I'm still looking for the bike in the basement in the Alamo. Replacing the fencing at the ranch with Wall. Nice oxymoron. If Carrie hated it, the beer must be good! https://www.actionnetwork.com/...s-betting-odds-vegas You betting the over or under this year? I was hoping to get the Pack at 7.5 or 8. Small sample size early. small sample size of late. That's true, except, Aaron Rodgers. Get your bets in now folks, and grab your popcorn!!! [Matt Perrault] According to @Ourlads_Shonka .... SHOCKER here ... he hears that Q. The key to being right is changing your mind a lot. One of them is bound to be close.